Filipinos light candles and hold a placard during a March 8 protest against the death penalty in Manila, Philippines (CNS photo/Mark R. Cristino, EPA). In a major speech on Wednesday Oct. 11 Pope Francis said in blunt terms that the death penalty is contrary to Gospel teaching. Given the setting and context of the talk—a celebration marking the 25th anniversary of the Catechism of the Catholic Church—Vatican observers speculated that a change in the Catechism may be forthcoming. The passage in question (No. 2267) allows for the death penalty in very rare cases. But now even that small window may be closed. America reached out to Sister Helen Prejean, the author of Dead Man Walking and longtime opponent of the death penalty, for her response to the news. At last, a clear, uncompromising stance of moral opposition to the death penalty by the highest authority of the church. Words in official teachings matter. At death penalty trials, in state legislatures and before pardon boards I have witnessed as pro-death penalty district attorneys passed over the words of Jesus calling for forgiveness of enemies to quote instead church teachings that they felt justified the premeditated killing of criminals. In New Orleans, I watched priests sent by the archbishop to the death penalty trial of Willie Watson, an indigent African man, to assure Catholic jurors that in good conscience they could vote for the state to kill Willie. Which, in fact, the state did on July 24, 1987, electrocuting Mr. Watson to death in Louisiana’s (very busy) killing chamber. 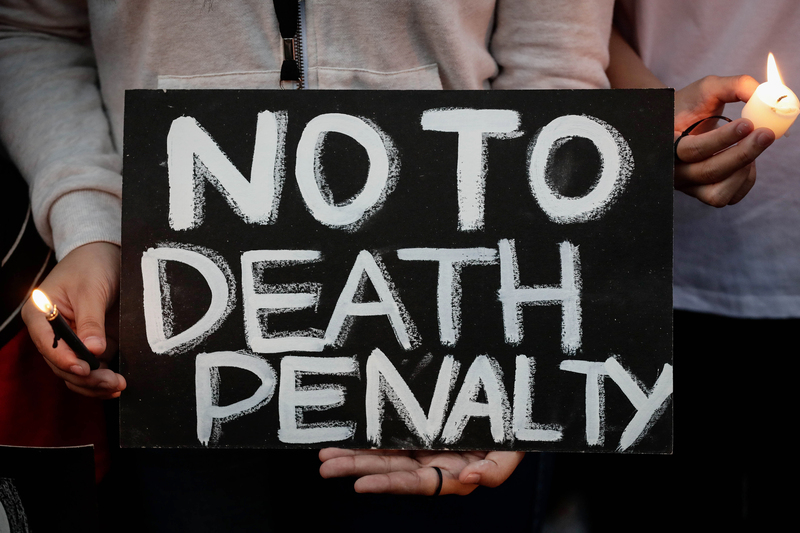 Signs of Life: The Catholic voice against the death penalty is growing stronger. This torture and killing in states continues today, terrible and mostly unseen, and Pope Francis’ words or a change in church teaching are not enough to change that. Only we, the people, freshly awakened to the call of the Gospel can make that transformation happen. First, we must meditate on and ingest the pope’s message so that the Gospel call in his words may set us on fire to act boldly, pouring into death rows, legislative halls and stations of public dialogue to persuade our citizens to truly become people of life. May the Holy Spirit enliven our hearts and guide us all. Thank you, Pope Francis. Again and again, you renew my hope. What worries me about the pope are quotes from this speech such as the ones below. Francis is good at nuance and skirting the edges with such words as "immutable reading" in an attempt to modify bedrock principles and paint those who try to live by them as rigid. Not surprisingly, the Sister missed why "Pope Francis’ rejection of the death penalty is so important." 1) For 2000 years the Church has, properly, taught that the death penalty is morally licit and consistent with the Gospel, as is well known, through today. 2) Pope John Paul II death penalty teachings, within his EV, were and are, obviously, factually and rationally in error and those errors were, somehow, amended into the CCC, as detailed (1). I understand that traditionally, the Church has taught that the state has the right to defend its citizens by executing people convicted of serious crimes. However, as with abortion (which I strongly oppose as a violent act against innocent unborn human beings) the Church can and sometimes does engage in the development of doctrine. Although the Church has from the beginning taught that abortion is immoral, it wasn't until at some point in the nineteenth century that the Church taught that both early and late abortions were "equally" sinful. As I understand it, for many centuries prior to the late nineteenth century, early abortions were in a sense viewed as being less serious than those performed late in pregnancy, in terms of the penalty applied to the woman and abortionist. This was due to the lack of knowledge about biology, although the Church rightfully always held that the deliberate destruction of an unborn human being ( embryo, fetus) was immoral. Similarly, I believe that the Church is correct in terms of developing Church doctrine regarding capital punishment. I have for years been a pen-pal with a man who has been imprisoned for life at Graterford Prison in Philadelphia. From our lengthy correspondence, I'm convinced that he has reformed his life. I favor life imprisonment, but I don't believe that deliberately killing even those people guilty of serious crimes deserve death. As Pope Francis stated on March 20, 2015, "Life, human life above all, belongs to God alone. Not even a murderer loses his personal dignity, and God Him pledges to guarantee this. As St. Ambrose taught, God did not want to punish Cain with homicide, for He wants the sinner to repent more than to die." True developments are not abrupt according to Cardinal Newman....nor would they contradict Romans 13:4 nor would they contradict Christ affirming implicitly the " die the death" penalty for cursing one's parents in Mark7:10. But I speak quixotically...97% of the clergy don't believe 100% of God's word. Francis might believe in 10%. "This torture and killing in states continues today, terrible and mostly unseen, and Pope Francis’ words or a change in church teaching are not enough to change that. Only we, the people, freshly awakened to the call of the Gospel can make that transformation happen." As many of the comments here already prove, it's hard to change opinions, if that's what one calls them. The evolution of morality, and it does evolve, in spite of the fears of some, won't happen until what is said is preached. I bet in the remaining years of my lifetime I will never hear from a pulpit what Francis has said. The ignorance of Catholics in the historical evolution of Catholic liturgy, practices, discipline, and even morality proves to me the failure of Catholic education. Besides having so many who have dropped their Catholic liturgical practice for lack of solid and internalized education in its true meaning, the irrational focus in Catholic schools on obedience and compliance has produced as well a stultified cadre of practicing and non-practicing adherents. Francis is the highest authority in the church (and I note Sister does use the small 'c' in church) ONLY when operating under the auspices of infallibility. He does not make this claim here. Willie Watson, who is referred to as Willie, and this being yet another indicator of Sister's struggle with her own Stockholm Syndrome, kidnapped, raped, sodomized, and to protect his own identity, shot in the back of the head, a Tulane University medical student. Her name, if Sister is in need of a memory jog, was Kathy Newman. Pardon me as Sister probably does remember her name for to forget would be unconscionable. With a history of violence, and with no obvious evidence of being African as Sister claims, Mr. Watson was executed and offered no final words of confession or even a request for mercy. Legal wrangling is not the same as a request for mercy, after all. Note that he did confess to the crime; one may speculate as to whether he confessed to the sin. I find it odd, this Christian teaching, of embracing and coddling the sinner as well as the sin under the guise of mercy. Perhaps an opinion such as, " A monster who should not be executed so his plea to the Lord for forgiveness is not cut short by artificial means", may be acceptable if not desirable but to see the face of God, and not of Satan, in such individuals is, at best, naive and is, at worst, self aggrandizement. If we are to outlaw capital punishment then the repudiation of murder need still be swift and never ending. Yes. I agree. The irrational focus in catholic schools on obedience and compliance has produced a stultified cadre... but of church leadership more than anything else. New found power does not imply any evolution of moral teaching unless this teaching is only accepted as valid by blind obedience to authority. Is this an evolution or a desire to implement the personal whims of leadership? I believe there is a difference. Helen Prejean, C.S.J., is the author of Dead Man Walking and The Death of Innocents.